The introduction of superplasticizers brings revolution in concrete construction making possible to place it where it was never possible before. With the use of superplasticizers, it is possible to render significantly higher strength with other properties known as high performance concrete. • It doesn’t have sufficient effect on setting time of concrete; but when applied with cements containing very small amount of C3A, they will result excessive retardation. • They have successfully used with fly ash in concrete mix. • Especially advantage is derived when used in conjunction with silica fume as silica fume greatly increase water demand to make mix workable. Initial dosage of superplasticizers should be applied just after water and cement become in contact with each other. It is considered logical as hydration associated initial reactions would produce difficulties to become superplasticizers effective; superplasticizers can’t produce sufficient deflocculation of cement particles. The preceding statement have been observed in concrete but yet not explained. The optimum time for addition of superplasticizers in concrete is theoretically that period approximately the starting of inactive period without superplasticizers in concrete. Actually addition of them at this time was reported to produce maximum initial workability and result in lowest rate of decrease in workability. This special time depends on type of cement and has to be determined by experiment. The actual situation in concrete construction, this is the practicality of addition of superplasticizers that dominate. Effectiveness of them to available cement particles to get re agglomerate lasts till there have sufficient molecules of superplasticizers to encapsulate exposed periphery of cement particles. Some molecules of superplasticizers become entrapped within the hydration products of cement which results inadequate supply of superplasticizers and thus workability of concrete mix is lost drastically. It is found that prolonged agitation or mixing of concrete results some products produced during initial hydration of cement to be split from the surface of cement particles which enables again hydration of hitherto unexposed particles of cement to occur. The presence of dissociated products of hydration coupled with commencement of hydration has influence on the reduction of workability of concrete mix. A comparison of loss of workability of mix is described in above figure. Naphthalene based superplasticizer was used in this example; two concrete samples are compared here one without admixture and other with superplasticizers. It can be noticed that loss of workability occurs much quicker in concrete having superplasticizers; but obviously, concrete with superplasticizers has lower water/cement ratio which will yield higher strength. Because duration is a prime parameter for effectiveness of superplasticizers, it is advantageous to introduce superplasticizers into the concrete mix in two stage, or even more, operations. Such re-dosage or repeated addition is possible when concrete is delivered to construction site by agitator truck. If it is required to restore workability by re-dosage after some period of actual mixing, adequate amount of super plasticizers should be added to act on both hydration products of cement and cement particles that are not hydrated yet. Therefore a small re-dosage of superplasticizers will not work, higher re-dosage is necessary. Though repeated addition of superplasticizers to concrete mix is found advantageous in respect of improvement of workability, they may increase segregation and bleeding. Other possibilities are to alter in amount of air entrainment and set retardation. Besides these side-effects, the second dosage applied to restore workability may reduce it at a faster rate than that of initial rate. Considering this effect, it is preferred to apply re-dosage immediately before placing and compaction of concrete. Following figure shows an effect of applying a re-dosage of superplasticizers (naphthalene based) on workability for a mix having water/cement ration of 0.50; the first dosage are followed by three re-dosage,each dosage were identical i.e. 0.4% of solids by weight of cement. The amount of Super plasticizer that is required to include in mix to restore workability change with temperature and water/cement ratio. More quantity of superplasticizer is required as temperature raise within the range of (30~60)0 C.
At present, there have superplasticizers that remain effective for a long period and re-dosage immediately before concrete placing can be successfully avoided. A better control in mix proportion can be achieved with this superplasticizer and therefore preferred by engineer. Retempering of concrete to retain slump is examined in many research, the effect of retempering at different water/cement ratios of concrete are examined with concrete containing 0.5% superplasticizers by mass of cement having water/cement of 0.5,0.6 and 0.7. At lower water/cement ratios, the retempering effect is found more pronounced in respect of slump increase. 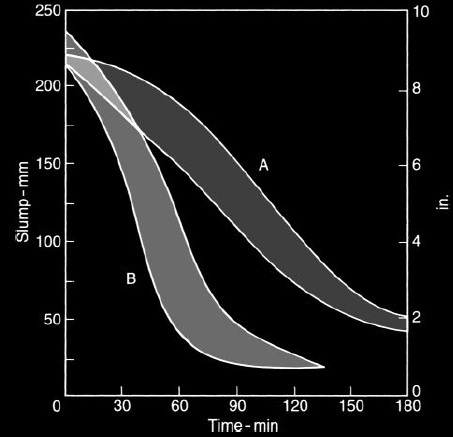 Though rate of loss of slump is identical for four samples, slump retention is found higher at concrete of low water/cement ratio. Again it is found that concretes having low water/cement ratio have higher strength than that is not retempered. • It do not have sufficient effect on setting time of concrete; but when applied with cements containing very small amount of C3A, they will result excessive retardation. • Special advantage is derived when used in conjunction with silica fume as silica fume greatly increase water demand to make mix workable. But if re-dosages is required, the higher quantity of superplasticizers is required than concrete not containing silica fume. • Existence of admixture except superplasticizers. Rate of slump loss of concrete depends on, as discussed above, type of superplasticizers; at 0.6% superplasticizer, the rate is found highest in sulfonated melamine formaldehyde as compare to Sulfonated naphthalene formaldehyde (SNF) and modified lignosulfonate. Slump loss is also influence by temperature; loss of workability is lower under lower temperature. 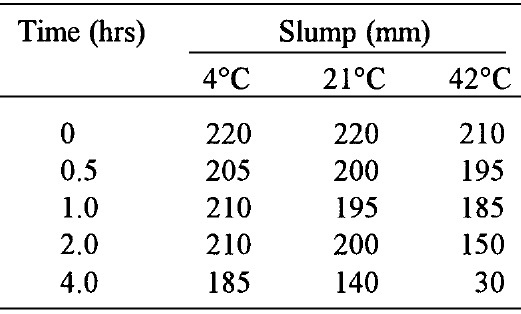 Following table shows an effect of change in temperature on slump loss of concrete having SNF type superplasticizers. During the period of slump loss, the tricalcium aluminate of cement reacts with gypsum which yields product having crystalline structure and distributed within mass. Thus reactions occur in aluminate phase have important influence on concrete workability. It is reported that when superplasticizer is added to concrete reaction between this phase and gypsum are enhanced; this rate, in addition, may also enhanced when excess sulfate is available in concrete. Slump loss was not found in C3A and gypsum system. However a relation between slump loss and C3S phase was established. To gain a particular slump, higher amount of silicate phase were essential, again greater loss of slump was related to this phase. Thus it seems to restore tendency of flocculation with restoration of change interactions between grains of C3S by formation of hydration coatings. When re-dosages of superplasticizers are applied, these charges are neutralized and thereby restore fluidity. However continuation of hydration will result slump loss. Any retarder exist in concrete to retard hydration of C3S are desired to stave off the commencement of quick loss.